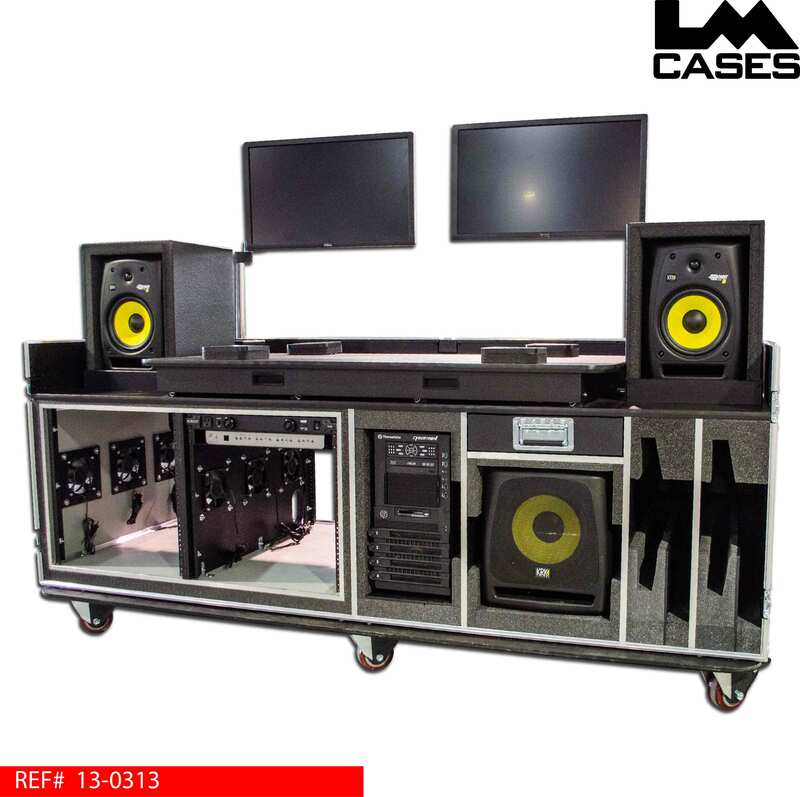 This case was designed for Volt Lites by the LM Cases Custom Integration Department to be a fully integrated front of house workstation for large scale tours. 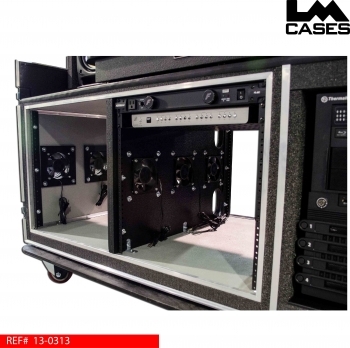 The LM Cases CI department handled the sale and installation of many of the case components such as the video monitors, audio monitors, mounts, custom cables, and rack mounted components. 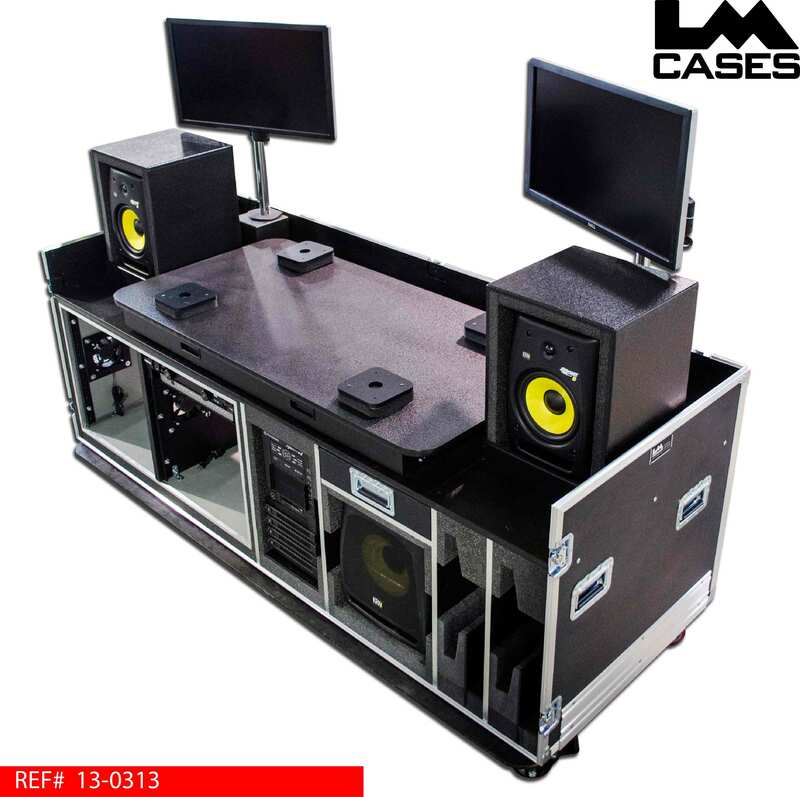 The case design is centered around the GrandMA 2 Fullsize lighting console which is mounted on a retractable shelf. 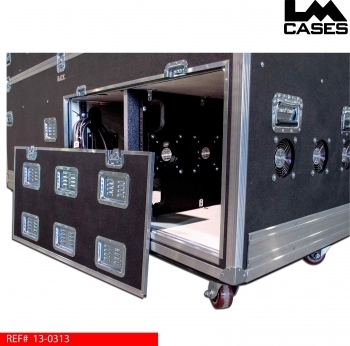 Because each show is programmed and run from the console, the case needed to have 2 distinct "Live" and "Program" modes. 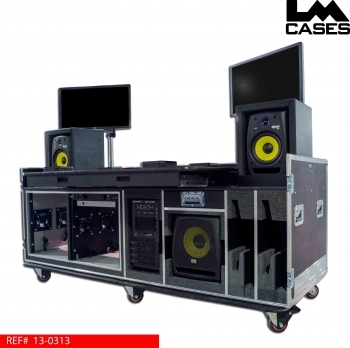 In Live Mode, the console is retracted over the case and the 2 monitors are moved over the audio monitors so the operator can see the stage. In Program Mode, the console can be extended from the case allowing the programmer to sit with their legs under the console like a traditional desk. 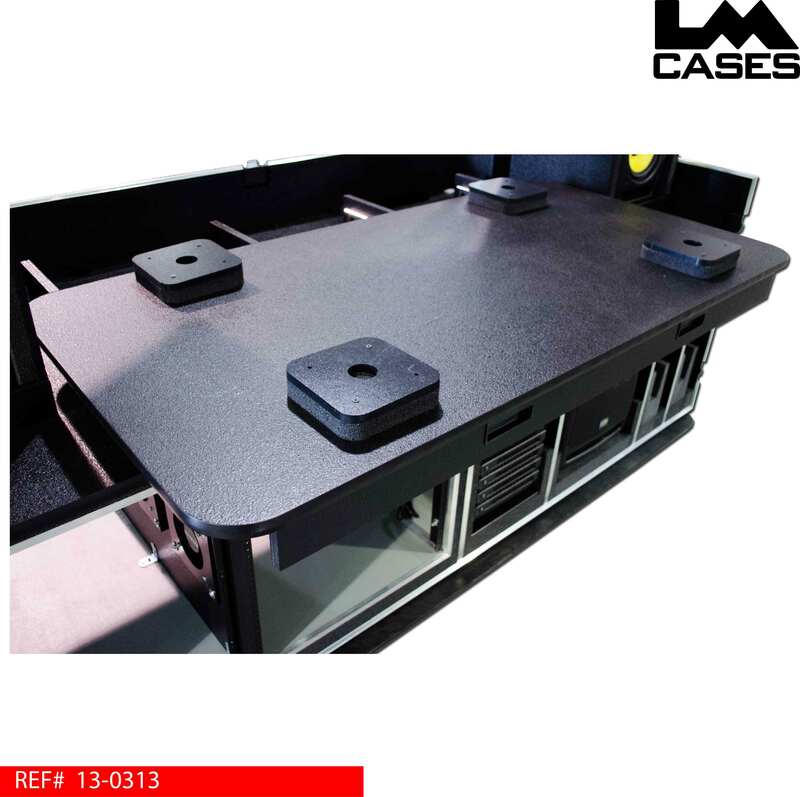 The console sits on 4 pedastals that hold it by its feet to keep it firmly in place during use and provide additional shock protection during transport. The console is also held by 2 lid mounted dividers that separate the console from the speaker enclosures. 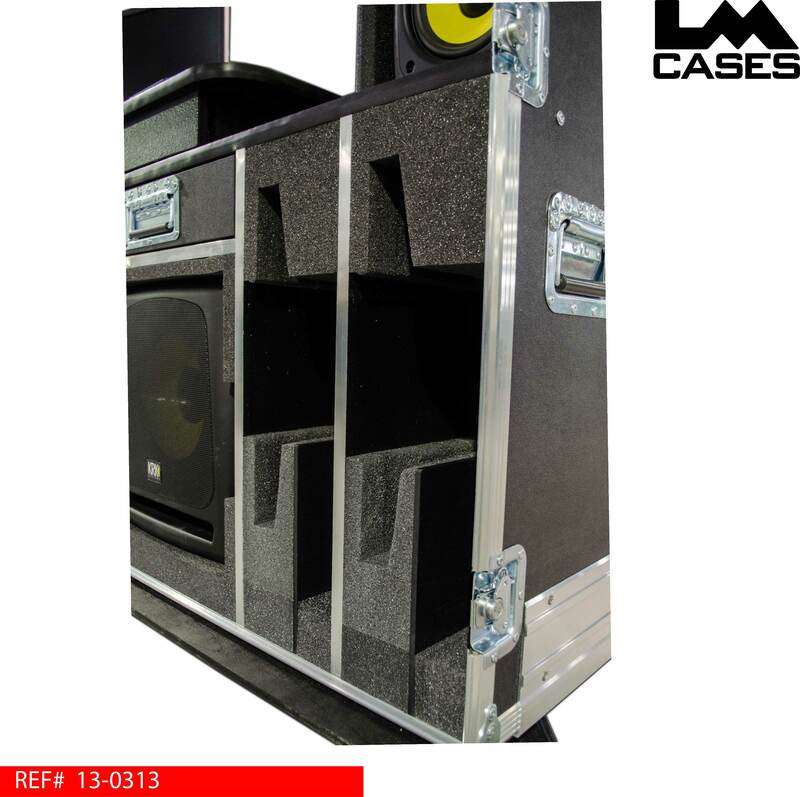 The pedastals are made out of PE foam and marine grade plastic. The monitors can also be move over the rear of the console for maximum visibility. 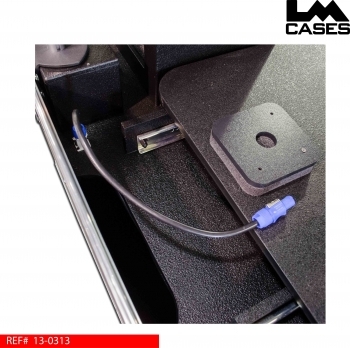 The LM Cases CI department created a Powercon inlet and custom cable to allow the console to be powered via the locking Powercon connectors. 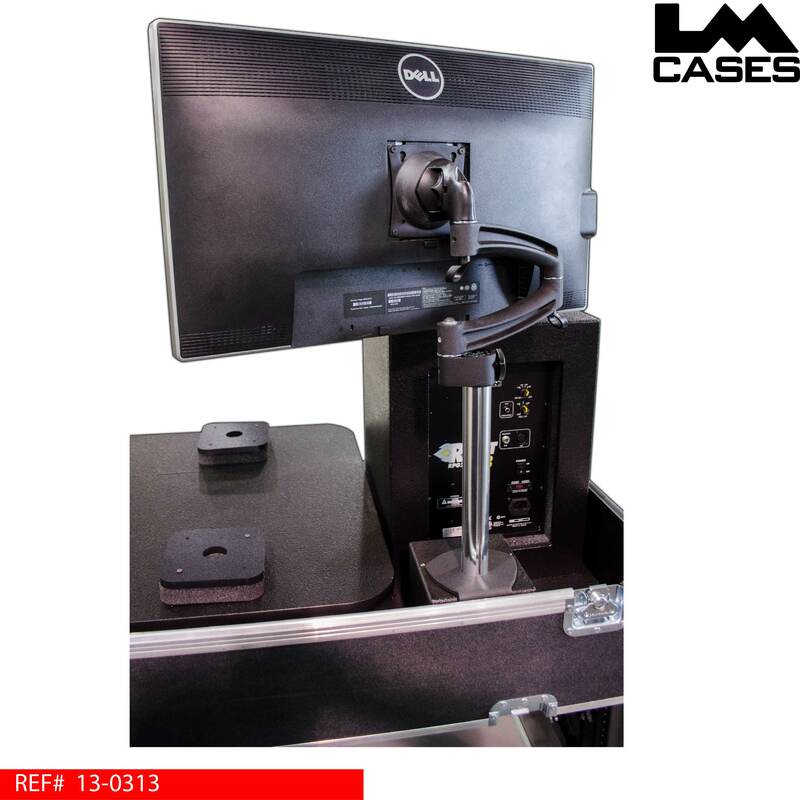 The Dell 23" LCD monitors are mounted on articulating arms allowing them to swing over the console and monitors and be spun between portrait and landscape modes. 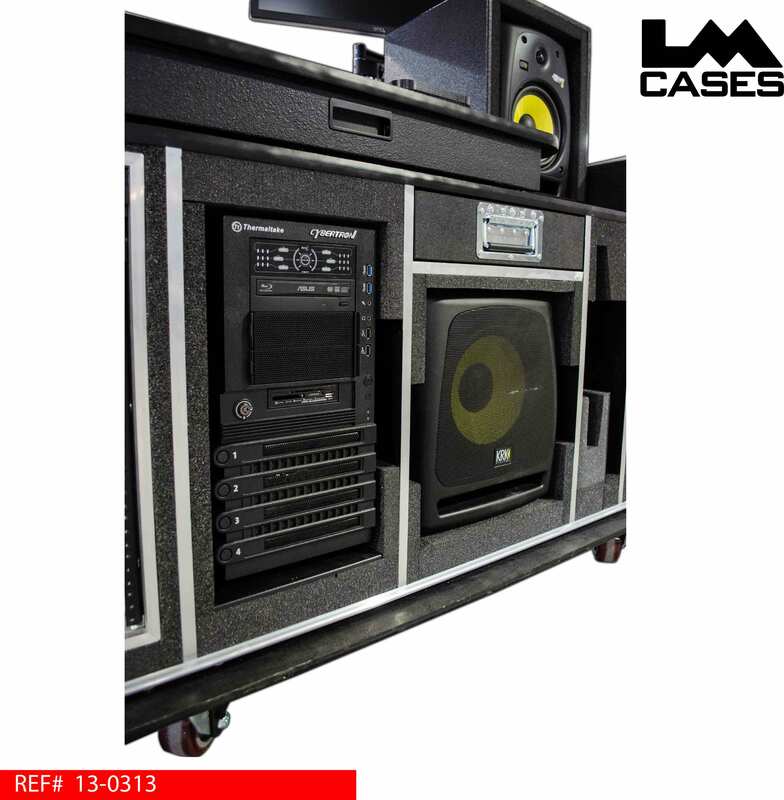 The video switching between computers, the console and media servers is handled by a 4 in 4 out video switcher. The audio playback system is based around a 2.1 KRK speaker system compromised of 8" monitors and a 10" subwoofer. 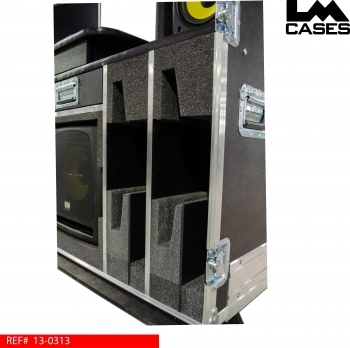 Custom black texture coated foam lined enclosures were created to hold the 8" monitors allowing all components to be firmly mounted during transport. All rack mounted equipment is housed in a 11RU shock mounted double wide rack under the console. The rack section is built out of 1/2" plywood laminated with silver abs plastic allowing a more reflective surface in case equipment needs to be serviced during a show. Cooling is provided by 9 fans pulling air from the outside and cooling both rack sections as well as the computer section to the right of the rack. The exterior case is built out of 1/2" plywood and features 4" x 2" Colson casters, deep recessed hardware and a 2 color silkscreen of the Volt Lites logo. The top lid has 4 recessed D-Ring shackles mounted in it to allow a table to be strapped to the top of the case during transport. 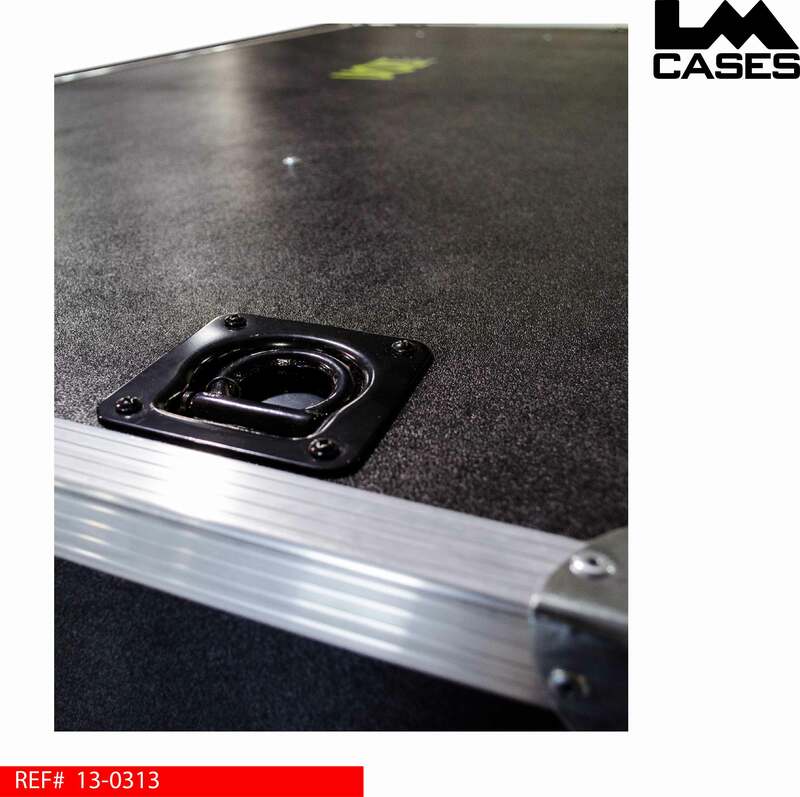 Because the case will be forklifted on to a FOH platform, LM Cases custom 1/4" aluminum forklift guard was employed. The forklift guard is contours the aluminum corner stock of the case and wraps under to provide extra protection when the case is lifted. 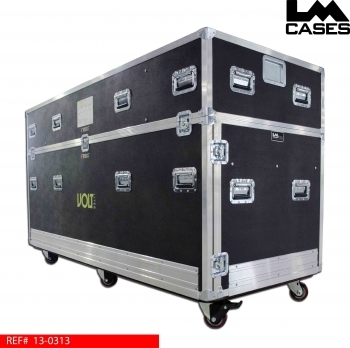 Special thanks to Matt and the Volt Lites team!